It’s hard to have a serious conversation about Southern food and culture with Southern Living being mentioned. So when they asked me to share a new recipe from their exciting June food issue, of course I said yes. 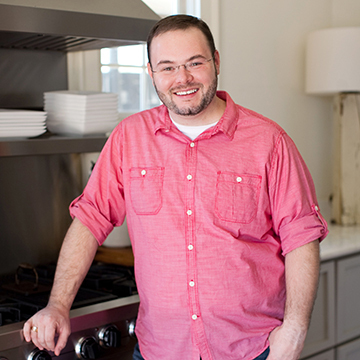 I got a sneak peek at the 5 Ingredient Summer Cookbook and the A to Z Guide to Southern Food. 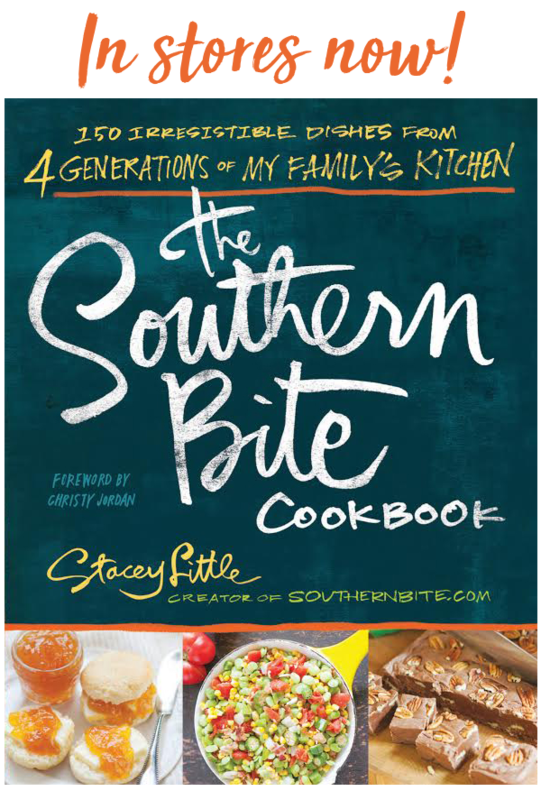 The cookbook is filled with simple summer sides, main dishes, and desserts- all requiring five or fewer ingredients – and the A to Z Guide features Southern provisions, people, places, and more. Y’all know me, so you know my passion for recipes that are easy and use only a few ingredients. So this mini-cookbook relay spoke to me. And while some of the ingredients fall outside of the things that I normally stock in my pantry – call me crazy, but I don’t always have whole snapper, Cotija cheese, or miso around – still many of the recipes are made with simple pantry basics. Scanning through the list of recipes, lots of things like the Hot Bacon Caprese Salad, Pimiento Stuffed Summer Squash, and Lemony Snow all sounded like great things to help get a delicious summer meal on the table, but the Tomato-Orange Marmalade Chicken really stuck out. And while I wasn’t really sure about how well the flavors would work together, I was more than pleasantly surprised. The red wine vinegar and acid from the tomatoes are the perfect balance for the sweet marmalade. I, in typical Stacey fashion, forgot to pick up fresh basil at the grocery store (and not wanting to make another trip back to the store – we don’t exactly live next to the store) so I used a few dashes of dried basil instead. It was a delicious meal that my family really enjoyed, but I do wish I had the fresh basil. 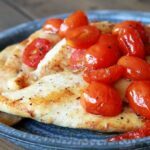 This is one of those dishes that has great fresh summer flavor and comes together quickly, so it’s great even for a weeknight. In typical Southern Living fashion, this is a beautiful issue with delicious recipes – that you know are all tested – and breathtaking photos. The fun A to Z Guide to Southern Food features some of my favorites from fried chicken (F) to my beloved Dukes Mayo (D). If you don’t already subscribe, you definitely should pick up this month’s issue! 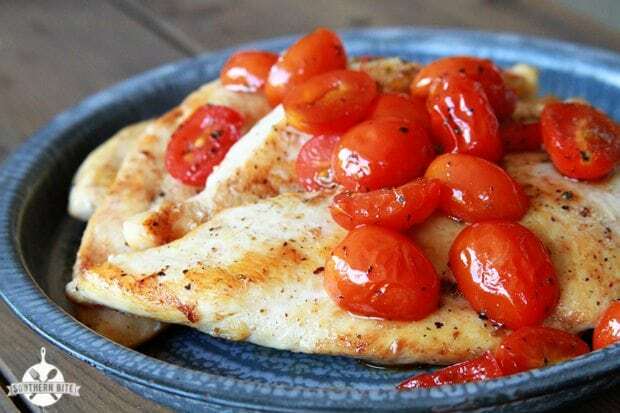 Place each chicken breast between 2 sheets of heavy-duty plastic wrap, and flatten to 1/2-inch thickness, using a small skillet or flat side of a meat mallet. Sprinkle chicken with salt and pepper. Melt 1 Tbsp. butter in a large skillet over medium-high heat. 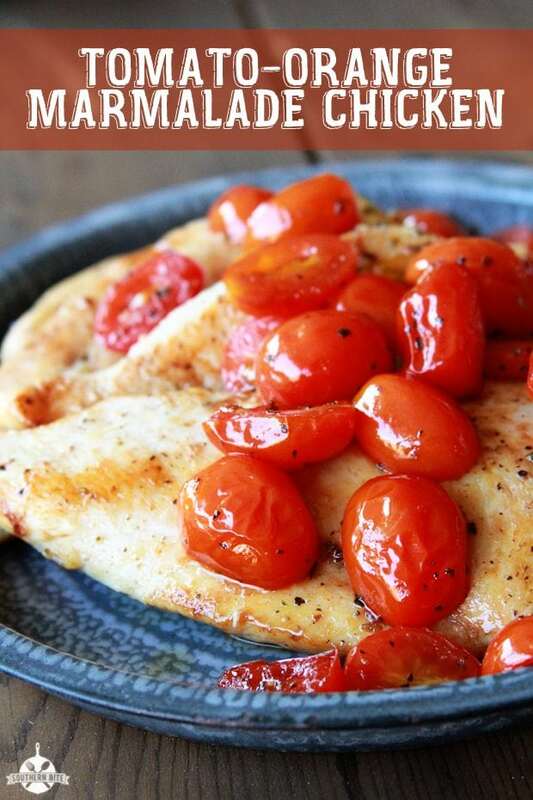 Cook 2 chicken breasts in skillet 4 minutes on each side or until done. Transfer to a serving platter; cover with aluminum foil to keep warm. Repeat procedure with remaining butter and chicken. Reduce heat to medium-low; add 3 Tbsp. water and half of tomatoes. Cook 2 minutes, stirring to loosen browned bits from bottom of skillet. Stir in marmalade and vinegar; cook, stirring occasionally, 4 minutes or until tomatoes burst and sauce begins to thicken. Stir in remaining tomatoes, and cook 2 minutes or until thoroughly heated. Stir in basil; add salt and pepper to taste. Spoon sauce over chicken. Hi Stacy..sorry this isn’t about a recipe (yet!) but am trying to “subscribe” to your blog and it will not let me! When I click the subscribe button there is nowhere to enter my e-mail? ?